I simply love clams, mussels, and oysters and the Philippines is blessed with much variety. Oysters top my list. I've been having some since I was a kid, and I do not just get my share any time I want to. My father, who is from Dagupan, loves oysters especially when he and his buddies have a drinking session at home. When his friends would visit us in Baguio, they would bring oysters as pasalubong. They would pour boiling water over it and bring out the beer. My brother and I would hang around and my father would give us a couple of oysters each. Just a couple, and then that's it. I guess I acquired the taste since then. And then there are all sorts of clams that get served on the dining table. The soup itself is wonderful. From the small tulya where you have to go through a lot of shells to have a taste of the meat (it looks more like soup, come to think of it) to the bisukol and the tahong... just remembering these make my mouth water! And what a treat it was when we had mussels for dinner last night! My wife bought a medium bag of tahong and cooked up a wonderful surprise. Heat up the cooking oil over medium flame. Saute garlic, followed by the onion, then tomatoes, and finally ginger. 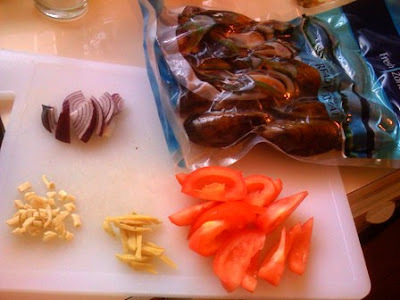 Add the mussels and mix. Cover and simmer. In our case, it did not take long because the mussels are pre-cooked. 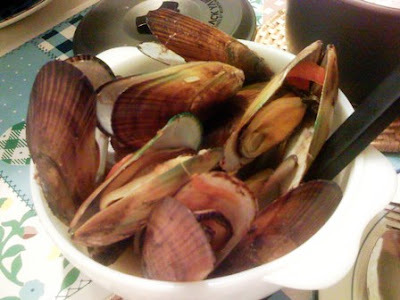 But if you use fresh mussels, you will know the shellfish is cooked already when they open up. 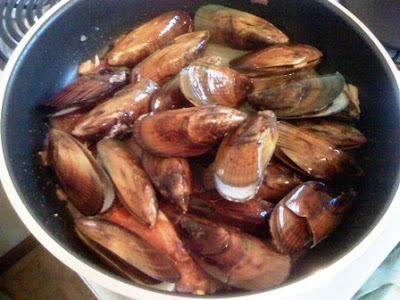 The mussels will eventually give off water and will boil in its own juice. You may add a bit of water if you want more of that flavorful soup. Dispose of mussels that did not open; these are considered unfit for consumption. Add salt and pepper to taste.